NOC (Nantahala Outdoor Center) in the Nantahala Gorge is a 500-acre playground for outdoor lovers. In addition to rafting and kayaking on the Nantahala River, you can fly on ziplines, play in the treetops, paddleboard on Fontana Lake, bike and hike. Replenish at two riverside restaurants, and get some gear at their stores. Located about 75 miles from Asheville (easy trip mostly on a four lane highway), it is tucked along the Appalachian Trail. Thousands of people flock to NOC on a warm summer day to kayak or raft down the river. The shimmering Nantahala River offers whitewater rafting through rapids that are mild but exciting. Nantahala rafting features eight miles of practice on easy Class II rapids before splashing through the exciting Class III whitewater of Nantahala Falls. Both guided and self-guided trips are available - either on rafts or ducks (inflatable kayaks). Miss the big crowds in May, September and October (great way to see fall color!) Go to NOC's website to book a river trip! This great spot for tacos & more by the river has outdoor decks for relaxing after your adventure. Enjoy live music every weekend night, May thru September. Take a paddleboard out on Fontana Lake (the Nanatahala River empties into Fontana Lake on the NOC campus). Paddle through a quiet mountain cove to see a 100-ft. waterfall. 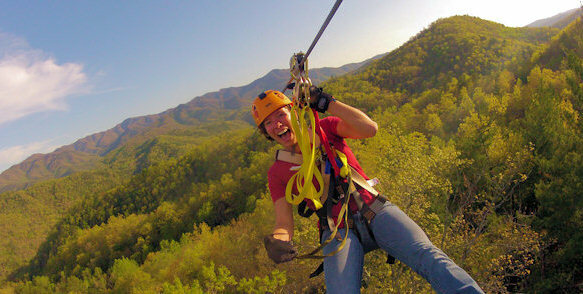 Nantahala Outdoor Center's Mountaintop Zip Line Tour includes a three-hour tour with a half-mile-long “Mega Zip” above Townhouse Creek Falls with views of the Nantahala Gorge, Fontana Lake, National Forest and Great Smoky Mountains National Park. The fully-guided tour (ten riders or less in a group with two guides) features 10 zips with an “above the trees” feel. Some zip lines provide traditional tree-to-tree rides, but overall the experience delivers more mountain-to-mountain experience. Fly almost a half-mile through the air and get up to 350 ft. above the forest floor. The Mega Zip is one of the longest zip lines in the East! 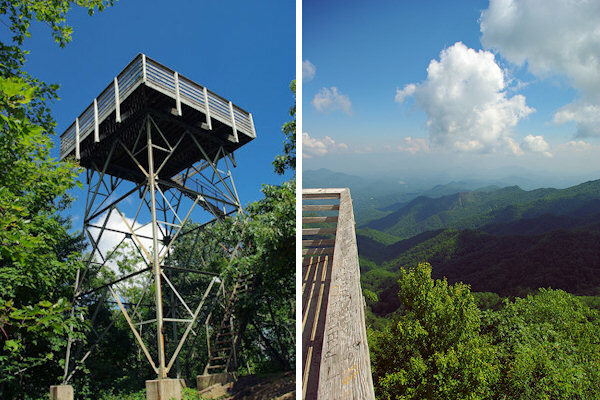 Enjoy 360-degree views and see landmarks like Clingman’s Dome and Cheoah Bald. Go to NOC's website for tour info and reservations. Zip through the night sky with expert aerial guides. Enjoy the cool night breeze as you fly under the stars for two miles, zipping from ridgeline to ridgeline. Wear glow sticks to turn the course into a brilliant light show of speeding colors. The highlight is the half-mile Mega Zip. All guests must have previous zip lining experience. Limited availability! Trips only occur on evenings close to full moons. At this self-guided adventure park in the trees, soar over 600 ft. through the air on the Wesser Zip; then take on a multi-level challenge course as high as 60 ft. above the forest floor. Each level features new obstacles: wobbling sky bridges, confusing spiderwebs, nerve-racking tight ropes and more exciting ziplining. With all these options, you can pick and choose your challenges based on your abilities. Once harnessed in you stay connected at all times, and you're free to negotiate the challenges ahead. Go to NOC's website for more. 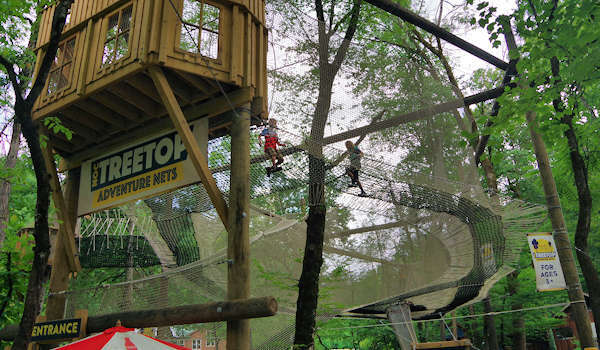 For ages 3 and up, this ship themed canopy feature is the first 100% net-based aerial playground in the United States - suspended up to 20 ft. above the ground floor with views of the Nantahala River. Explore, climb, slide and navigate through a series of tunnels, open spaces, chutes and pathways. Open May-October. 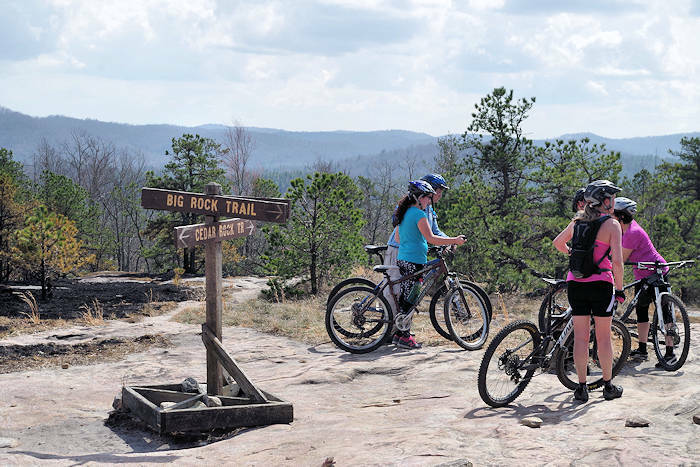 At NOC, there are many options for outdoor adventure. You can package your rafting trip with other adventures offered on campus. 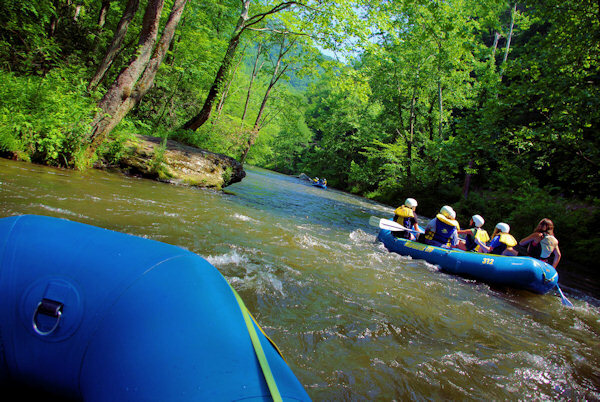 Save a bundle with the Nantahala Adventure Pass for a full day of fun. Go to NOC's Web site for more. With their Rapid Transit package, take a 3-hour scenic excursion on the Great Smoky Mountains Railroad from Bryson City to NOC. 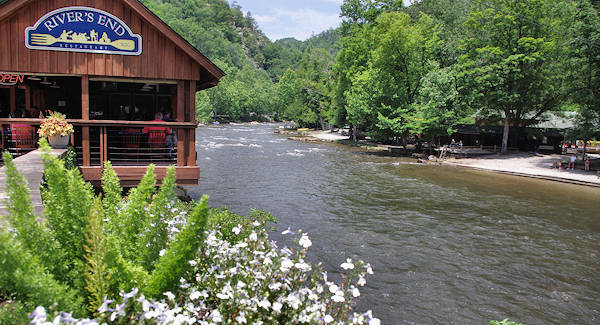 After a riverside picnic, go whitewater rafting down the Nantahala rapids. Then they transport you back to Bryson City. 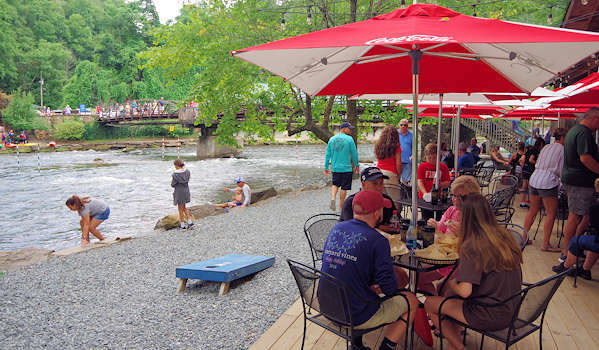 Enjoy breakfast, lunch and dinner at this longtime riverside favorite, with a menu that includes chicken biscuits to the hand-patted Voracious Vegan Burger and a few all-time favorites—Sherpa Rice, Appalachian Fish Tacos and the Nantahala Gorge Wrap. Save $25 by combining two fun adventures at NOC. Ride the river rapids with a fully-guided rafting trip in the morning, then fly on two miles of Mountaintop Zip Lines with 360-degree views of the mountains. All gear and equipment included. May-October, allow 6-7 hours. Go to NOC's website for more. April 13-14, 2018: Celebrate spring in the Smoky Mountains with a free, family-friendly event in the Nantahala Gorge with the NRC 4Fun Freestyle event, vendor fair, gear demos, and specials at NOC's Outfitter's Store. April 20-21, 2018: In teams of 6 or 12, participants of this epic overnight relay race 212.5 miles along trails and country roads from Brevard, NC to finish at Nantahala Outdoor Center. Hailed as the most challenging race in the southeast, all are invited to celebrate with the racers as they finish. May 26, 2018: Participants negotiate a series of challenging elements while racing to the finish in this family-friendly adventure race along the Nantahala River near Bryson City, NC. Choose between the 5K Dash or a 1K Fun Run. Celebrate the 4th with live music and specials. 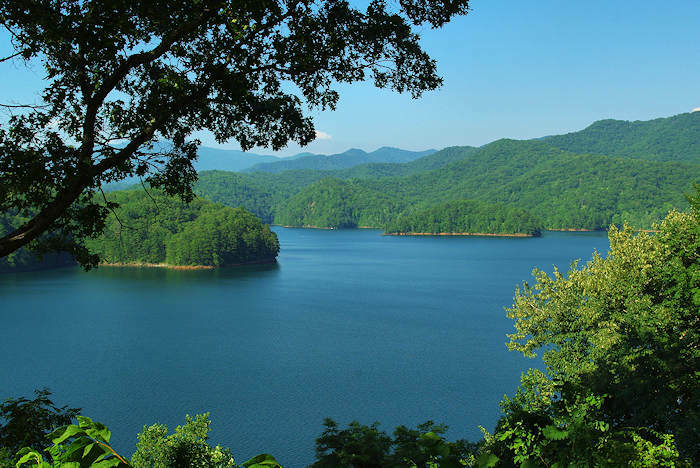 Cool off with a raft trip down the Nantahala or a lake kayak tour on beautiful Lake Fontana. Enjoy plenty of onshore entertainment. September 28-30, 2018: NOC thanks loyal guests for another great year with unbeatable discounts on outdoor gear and gifts, live music and entertainment for the whole family, as well as food and beer specials. Since 1972, NOC has been leading courses in whitewater rafting, kayaking, canoeing and river leadership. Over the year's they've grown to become one of the most convenient, comprehensive destinations for learning in the outdoors. They are the top school for kayak instructors and raft guides, and a destination for backcountry leaders to get wilderness medicine certification. Go to NOC's website for more. (About 75 miles, but mostly four-lane roads) Take I-40 West toward Knoxville, TN. Take exit 27 onto US 74 West toward Waynesville. The Nantahala is located 50 miles down this road. Stay on 74 West. Eight miles west of Bryson City, the four-lane highway you are on will split into two 2-lane roads. Stay on 74, which is the left lane. Go another five miles. On the last descent you will see a yellow caution sign on the right indicating you are entering the Nantahala Gorge. Just after the sign you will see the Nantahala River, and NOC's Nantahala Outpost. Go to NOC's website for more. For more info on rafting in the North Carolina mountains, see our Whitewater Rafting Guide.